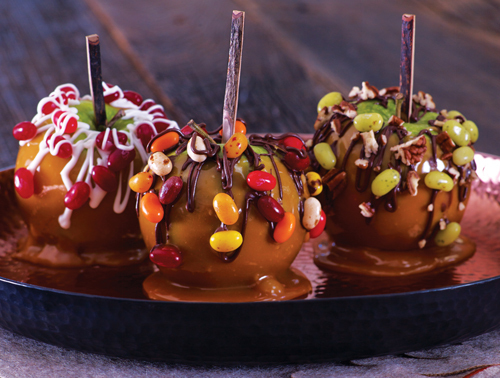 Harvest Caramel Apples are great for any festive Holiday dessert or treat! These are great to make with the kids. Recipe makes up to 6 Harvest Caramel Apples. Insert lollipop sticks into stems of Granny Smith apples; place in refrigerator 30 minutes. Line tray with non-stick waxed paper, spray lightly with cooking spray. In large saucepan, add 2 tbsp water and caramels, stirring constantly on medium-low heat until caramels are melted (add remaining ½ tbsp of water if necessary). Once melted, remove caramel from heat. Working quickly, dry apples if necessary, and dip in caramel or spoon caramel over apples to coat. Turn apples upside down for a minute to coat and remove excess caramel from bottom before placing on greased waxed paper. Press Jelly Belly jelly beans into caramel to create patterns or designs. Refrigerate about an hour to set. Remove from refrigerator and let stand 10-15 minutes before serving. Keep refrigerated.